De Nora acquires Neptune Enterprises;MARS Company named one of the 2018 "Top 25 Utilities Tech Solutions Providers"
De Nora has announced the acquisition of a majority interest in Neptune Enterprises, LLC, forming De Nora Neptune, LLC. 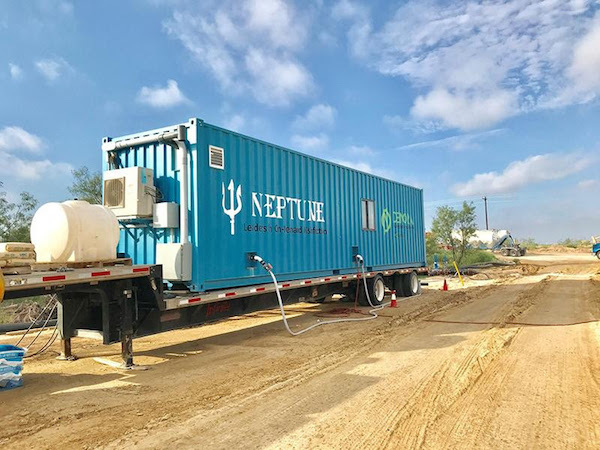 A Texas-based water service company, De Nora Neptune has specialized in “on-the-fly” frac water treatment and cost-effective produced water recycling in oil and gas industry since 2012. As the service arm of De Nora, De Nora Neptune brings to De Nora an unrivalled service capability to directly serve the industry and provide on-the-ground support to their existing technology customers within the Permian Basin and beyond. MARS Company Named One of the 2018 "Top 25 Utilities Tech Solutions Providers"
MARS Company was recently recognized as one of the top 25 Utilities Tech Solutions Providers for 2018. This is a CIO Applications magazine annual listing of companies providing Utilities technology solutions helping clients build a competitive advantage and transform their businesses. MARS Company is an industry leader focused on providing water meter test bench systems, M3 Enterprise Software solutions, MARS Calibration Certification (MCC) and on-site training programs. These innovative solutions are used to build a stronger network within the waterworks industry while boosting digital applications as the norm for municipalities and utility companies. With patented, award-winning, state-of-the-art technologies, the goal of the company is to lead utility management companies in recovering revenue lost due to reporting inaccuracies, real and estimated water losses via sustainable and environmentally sound avenues. Anue Water Technologies has been awarded exclusive distribution for Pi2 Technologies Geo-Membrane products for the entire USA, Canada and the Caribbean region. Anue is a manufacturer of high-efficiency Ozone and Oxygen generation and related systems for the elimination of odor, corrosion and FOG (fat, oil, grease) in municipal and industrial wastewater. Duperon Corporation has announced that Duperon President Mark Turpin has joined the Berg Business Board. The Berg Business Board is a group of area businessmen and women who lend their expertise, advice, and support to Heidelberg University students. By providing resources, evaluating programs, and offering internship positions, the board offers valuable industry experience and makes connections between classes and real jobs. Aclara will provide a dual-fuel smart metering solution that includes SMETS2 gas and electricity meters as part of a new contract with OVO Energy, the UK’s largest independent energy technology company and supplier. Emerson has announced it has acquired KnowledgeNet (KNet) software from Tunisia-based Integration Objects. KNet’s analytics application software accelerates digital transformation initiatives for process and hybrid industries. KNet is used to extract, clean, transform and analyze operational and manufacturing data. Using libraries of advanced statistical and machine-learning algorithms, the software consumes large quantities of diverse information technology and operational technology data into actionable knowledge that drives real-time decisions to improve process and asset performance. Aerzen Canada is in a growth and expansion mode. The company celebrated the opening of a brand new, 26,000 sq ft building with office space and a production facility. The event was held on March 1t and was attended by employees, customers, vendors and members of the national sales teams. “Aerzen Canada was founded in 1987 with three employees. Since then we have grown steadily to the point where we have outgrown our facility. This new building provides our customers with more capacity, higher quality and even better support with new processes, tools, and technology,” said Paul Birdi, Aerzen Canada’s Company President. The San Francisco Public Utilities Commission received its first payment for sale of its biosolids-based fertilizer. Lystek International (Lystek) has partnered with the SFPUC to convert biosolids, the nutrient-rich soil-like product from wastewater treatment, into a marketable, renewable fertilizer, which is now being sold to local farms. Harlan Kelly Jr. of SFPUC & James Dunbar of Lystek International. Dow Microbial Control officially changes its name to DuPont Microbial Control, marking the alignment with the DuPont brand and the successful separation of the Dow company from DowDuPont. DuPont Microbial Control represents the combined power of Dow’s pioneering history of developing products that control the growth of harmful microorganisms, now enhanced by DuPont’s world-leading position in the biotechnology space. Franklin Electric welcomes Chris Downey as its new Territory Manager for the north central region and Shane Wright as its new Territory Manager for the southeast region.